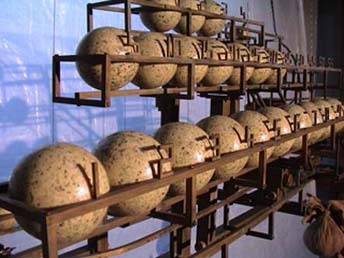 This ball clock, made with billiard balls and a brass frame, weighs 35 kg and is 1.8m high, .6m wide and 1.2m long. 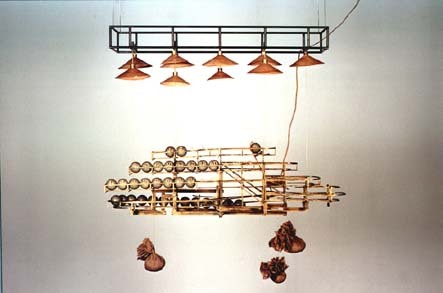 It can be set up to make violin noises and/or loud rumblings utilizing a series of passive loudspeakers that the clock hangs on, with the resultant noise being created by the clock's movements and vibration. 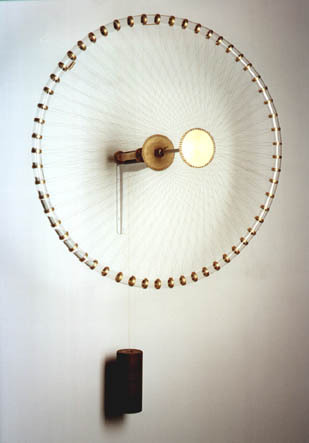 Another time piece (Sand Wheel) is a prototype made exclusively from brass and glass. It functions as a clock, but contrarily to most clocks it runs only forwards. This avoids the friction caused by the escapement either stopping the clock or stopping and reversing slightly, friction that results in high wear and tear of the mechanism. The Ralston sand wheel is in fact the escapement and the clock. It can be read from the level of the weight and the turn of the wheel, or, with the addition of a simple mechanism consisting of two fingers and two gears, the time can be read in the conventional manner. 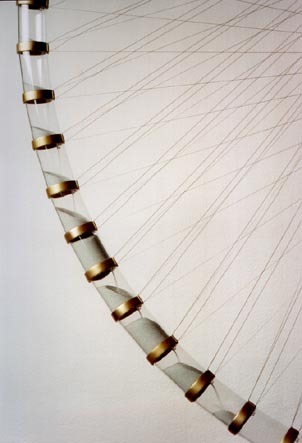 The Ralston sand wheel is filled with tiny glass pearls that are contained in a series of interconnected glass chambers, with the connections being small tubes (also from glass) that allow the pearls to flow from chamber to chamber at a controlled rate. The wheel is weighted on its axle, which causes it to turn, but the weight is not enough to lift the glass pearls (the counter balance) over the middle point, and thus the pearls flow continuously down from chamber to chamber as the wheel turns at a rate relative to the weight of the glass pearls and the weight on the axle. By adjusting these weights it can be regulated to one turn per hour.